The South Downs is the new kid on the block when it comes to National Parks. It was officially declared as such in April 2011, so it's the newest National Park in Britain, stretching for 87 miles from Winchester to Eastbourne, with the legendary Beachy Head marking its Eastern-most point. Just north of this iconic landscape lies Canfields, an organic farm tucked away in the picturesque village of Rudgwick. It may sound quaint enough, but thrill-seekers will be glad to know that you’re close to the 55-mile Downs Link and the Olympic cycle road race route in the Surrey Hills. Onsite, however, it's a much more sedate affair. Expect to hear little more than the crackle of fires and the faint call of a woodpecker. Once you arrive, you'll be greeted by Tim, who will take you on a tour of the site. There's a play pitch where kids can get stuck into lazy games of football, rounders, badminton, plus bluebell woods (perfect for den-building), stream-damming and plenty of deer-spotting opportunities. 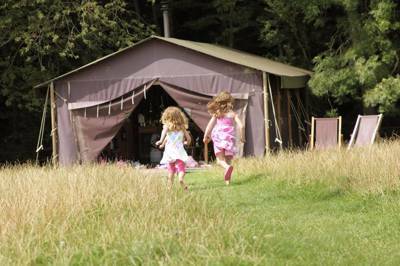 The safari tents are sited around the edge of this pretty little spot, on the edge of a bluebell woods. And what tents they are. If you're unfamiliar with Feather Down Farms, imagine rustic glamour, with a homely twist. This is a nod to the wild camping experience, but with the luxury of some essential creature comforts, such as wood-burning stoves, real beds, running water and a dining table fit for a banquet. So – while the kids are off exploring – you can sink into a deckchair and get stuck into a chilled bottle of sauvignon blanc. There's little else you'll need to worry about – the owners are happy to help out where possible, so you can just enjoy your trip. An essential part of the Feather Down experience is cooking. Thankfully, all utensils are provided in each luxurious safari tent, so you don't need to worry about lugging an oversized stewpot from the car. 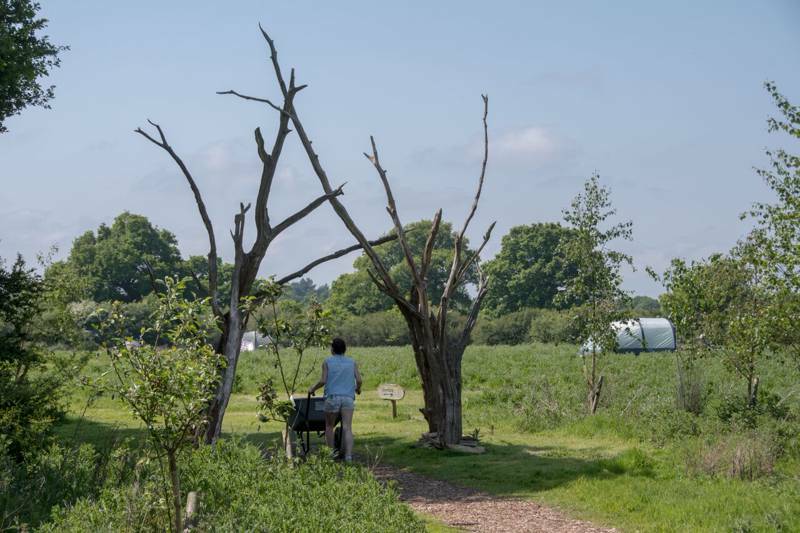 Simply build a campfire and slow cook some delicious veal (available from the onsite shop) whilst you look over the commanding views of the South Downs and the glistening sea beyond. The South Downs Way is on your doorstep – explore it on two feet, or hire a bike (advance bookings essential). You can cycle from pub to pub or take a more serious trip on the South Downs Link. 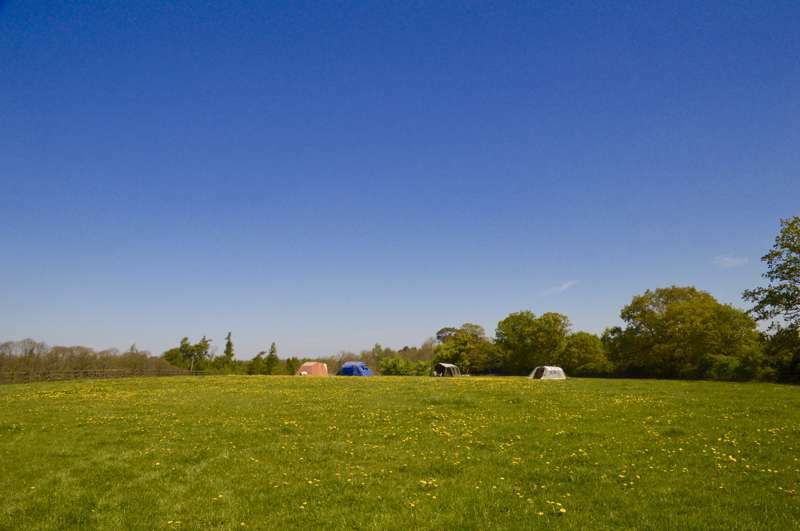 Come at the right time of year, and the campsite is an ideal base for enjoying the races at Goodwood (01243 755022), Fontwell (01243 543335) and Ascot (08443 463000); the opera at Glyndebourne (01273 812321); polo at nearby Hurstwood (01483 272828); and the annual Petworth Arts Festival (01798 343055). Budding Tiger Woods' can revel in the choice of five golf courses, all of which are within fives miles from the farm: Wildwood, Foxbridge, Gatton Manor, Slinfold and Cranleigh. But if you're looking for a more relaxing day trip, then you'd be hard pressed to beat Denbies' (01306 876616) award-winning vineyard in Dorking. You can take indoor tours throughout the year, or an outdoor vineyard train between March and November. Rudgwick village boasts four local pubs: the Fox (01403 822386), The Mucky Duck (01403 822300), the Sir Roger Tichborne (01403 751873) and the Richard Onslow. However, nearby Horsham boasts a more diverse selection of food spots, including the Artisan Patisserie (01403 274142; great for tea, cake, and a loaf of fresh sourdough bread) and Restaurant Tristan (01403 255688), which brings modern European cuisine to the heart of West Sussex. Take the A281 from Horsham towards Guildford. After 7 miles at Bucks Green, pass the turning to Rudgwick on the right. Opposite The Fox Inn on the left, turn right into Lynwick Street. Canfields Farm is the first farm on the left the entrance is signed Feather Down and Canfields Cottages.